In this week’s showcase, I want to highlight two clients that took advantage of our Template Personalization Service (TPS for short). With the TPS, our NE1 clients can have their chosen template personalized to include their logo, name and slogan embedded into their website as a part of their template. Our first TPS showcase is Syosset Gospel Church, in Syosset, New York. They had chosen our “Amazing” template, but then asked if they could design they could replace the entire image that was at the top of the template. They had sent in 2 different images of an open bible and then asked if we could just add their name and a bible verse to it. We did just that and they were extremely happy with the results. 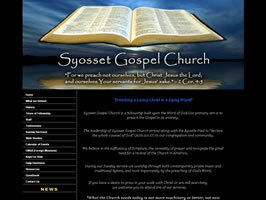 You can visit their website at http://www.syossetgospelchurch.com. Grace and Truth Ministries is a ministry run by Pastor Marty Dickerson. He has placed several of his teachings and sermons into MP3 format and is using his website to distribute these teachings to the public for free. Pastor Dickerson did not have a logo to use, so what we decided to do is design the title of the organization in a way that would represent a logo. The “Heavens” template was chosen and we used a beautiful script font to represent God’s beauty and the wonder of His grace. The end result came out very nice. 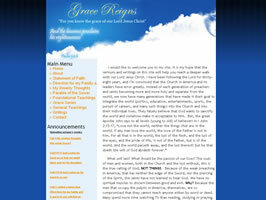 Feel free to visit pastor Dickerson’s site at http://www.gracereigns.org/.